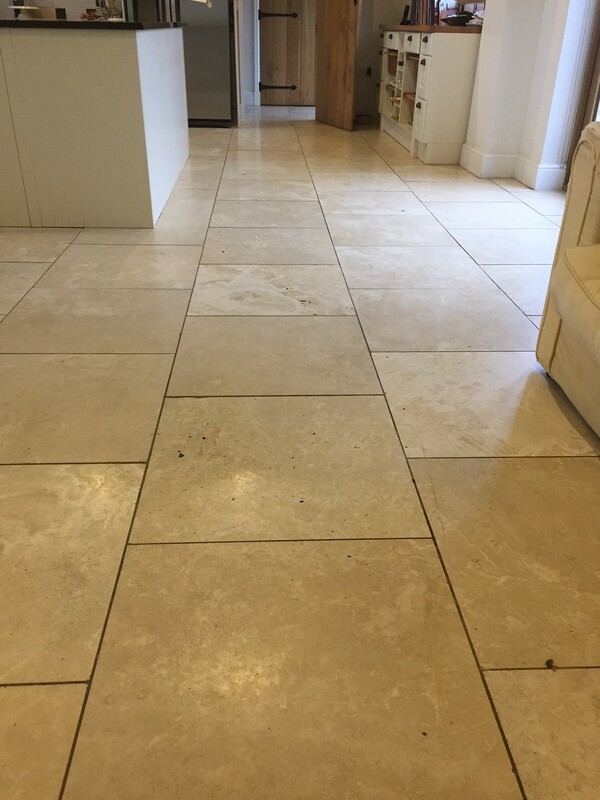 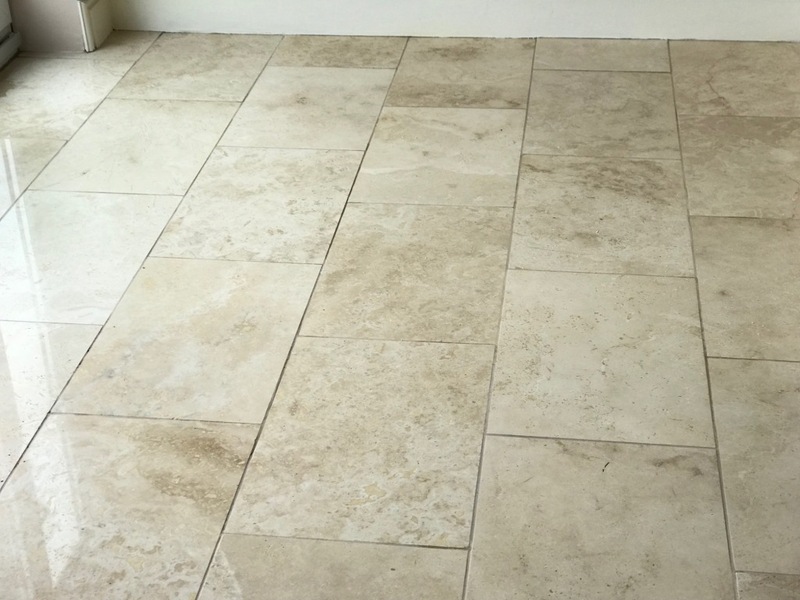 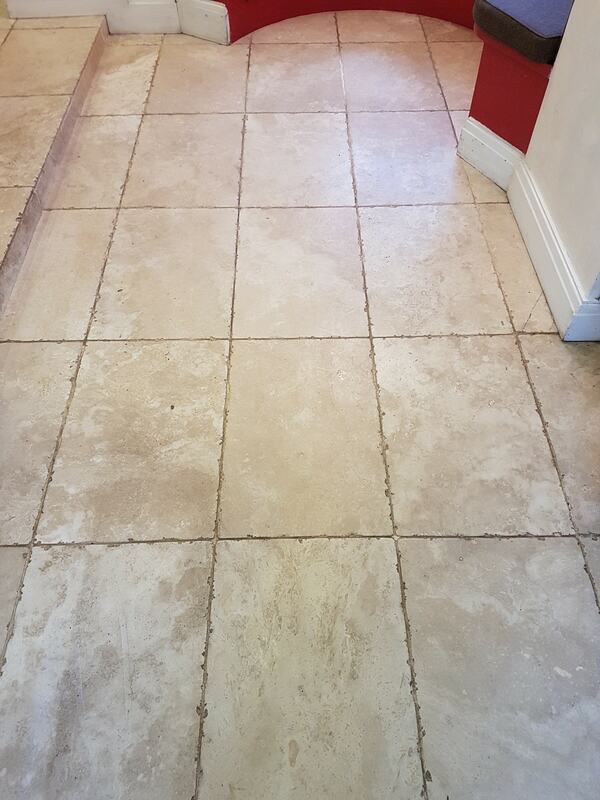 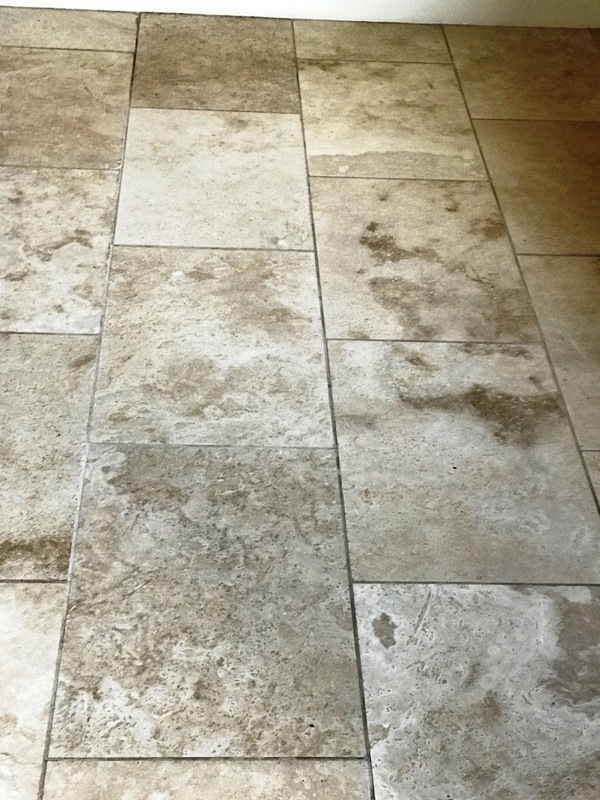 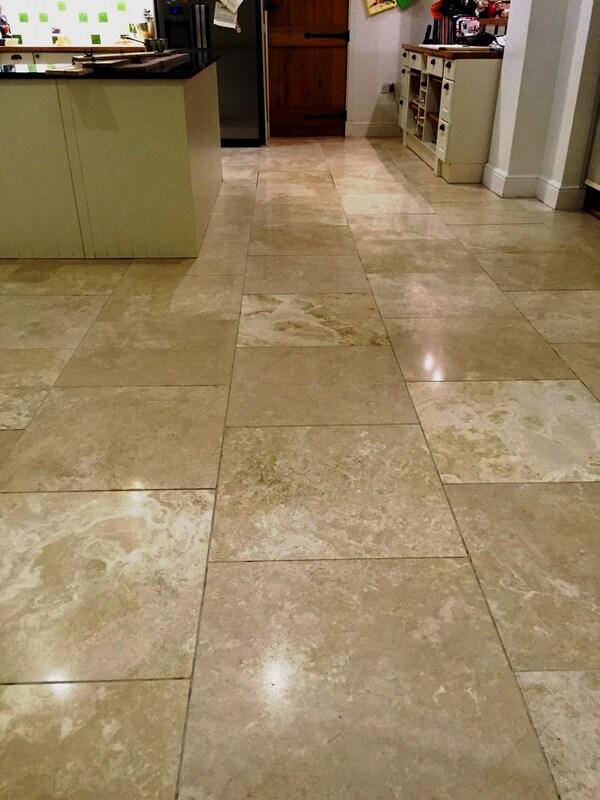 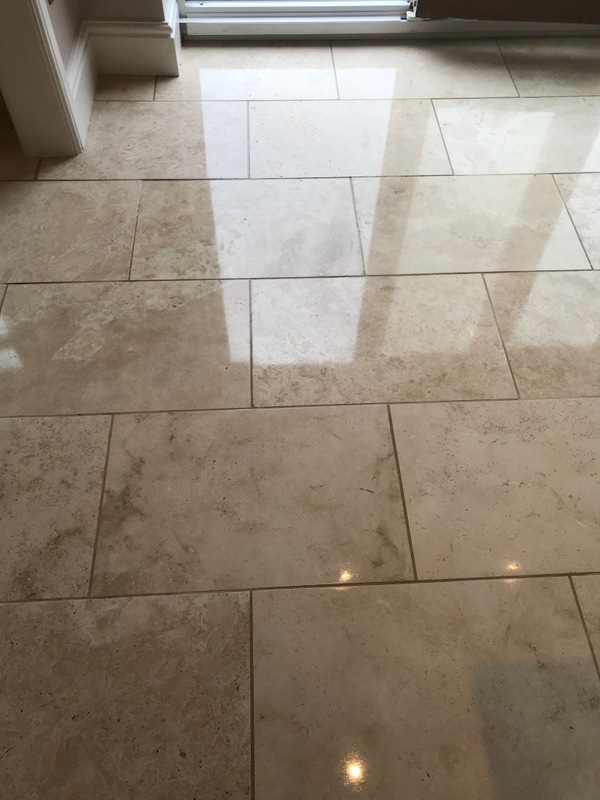 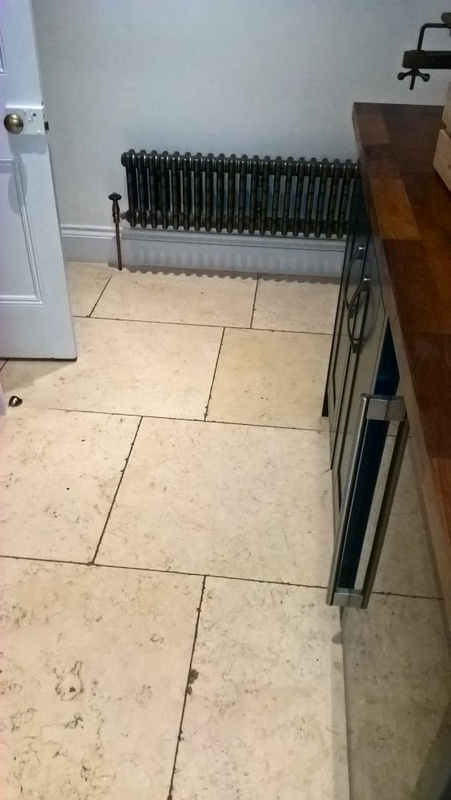 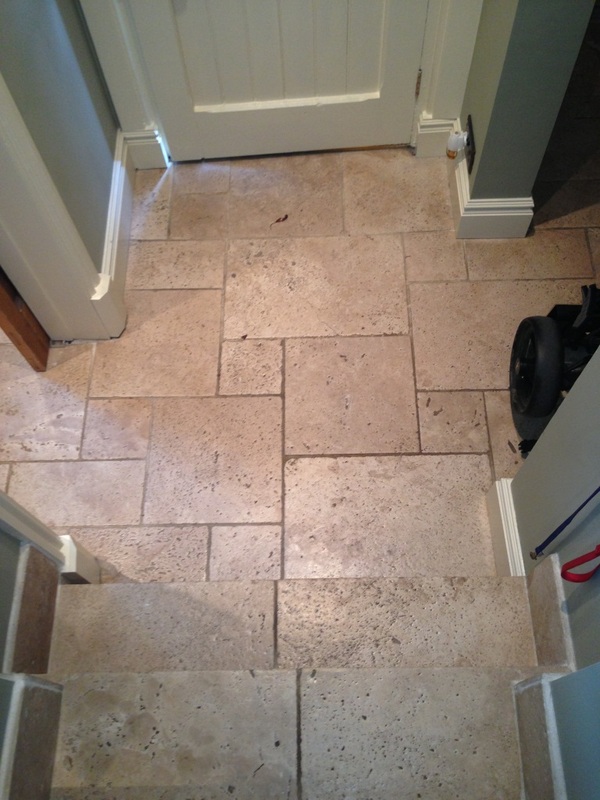 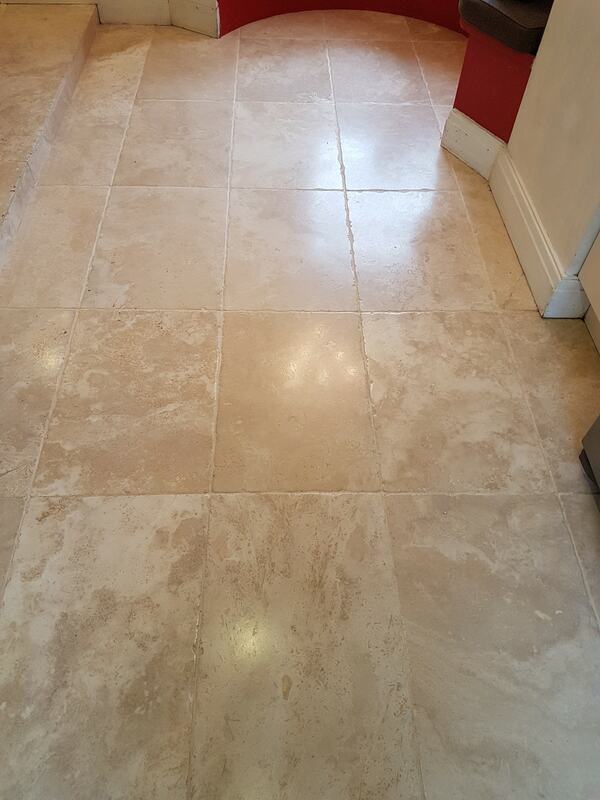 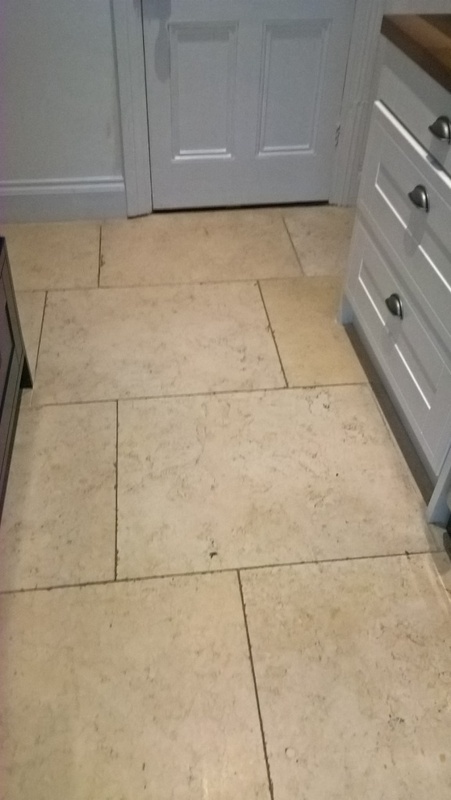 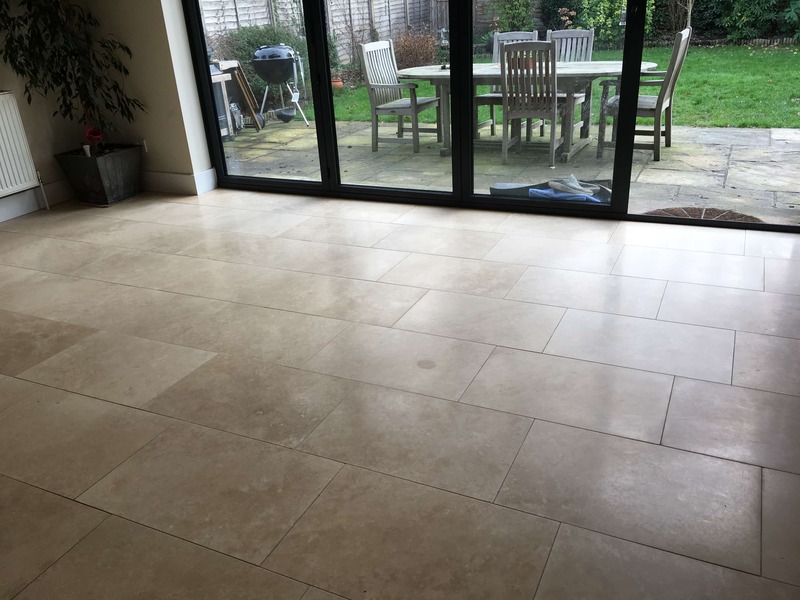 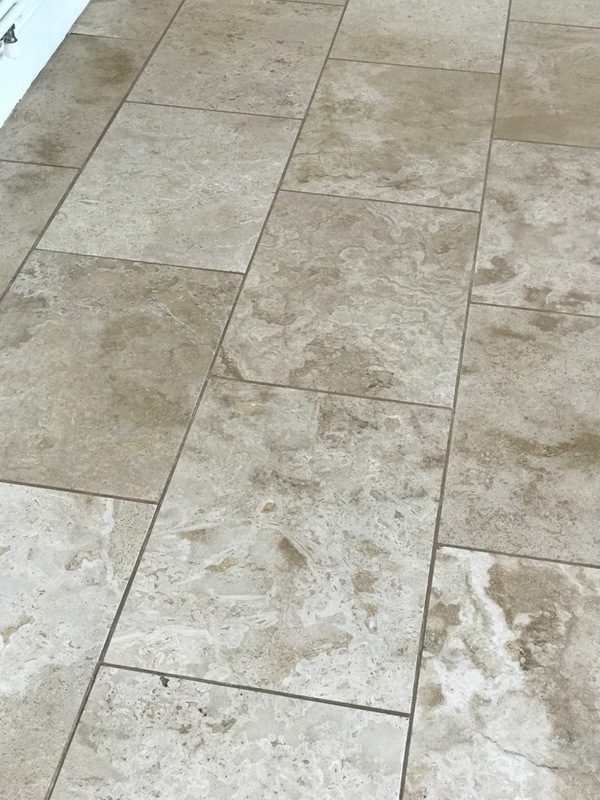 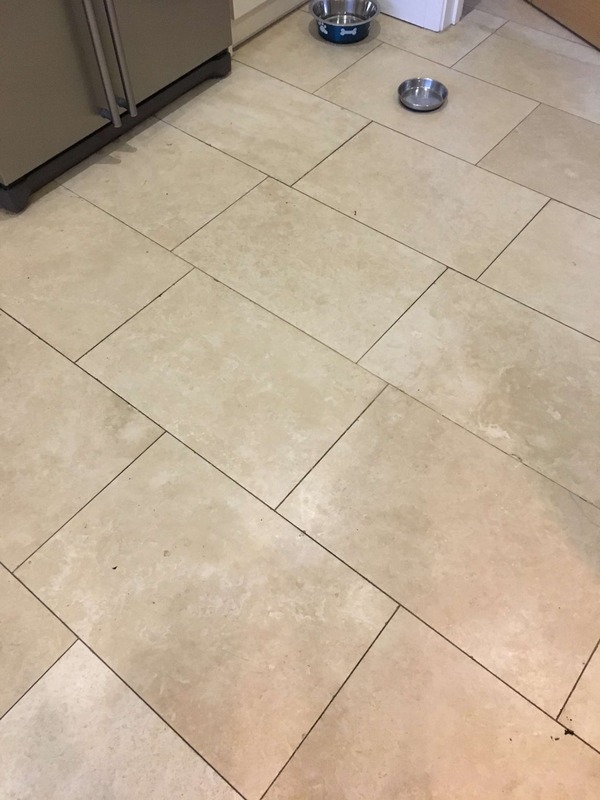 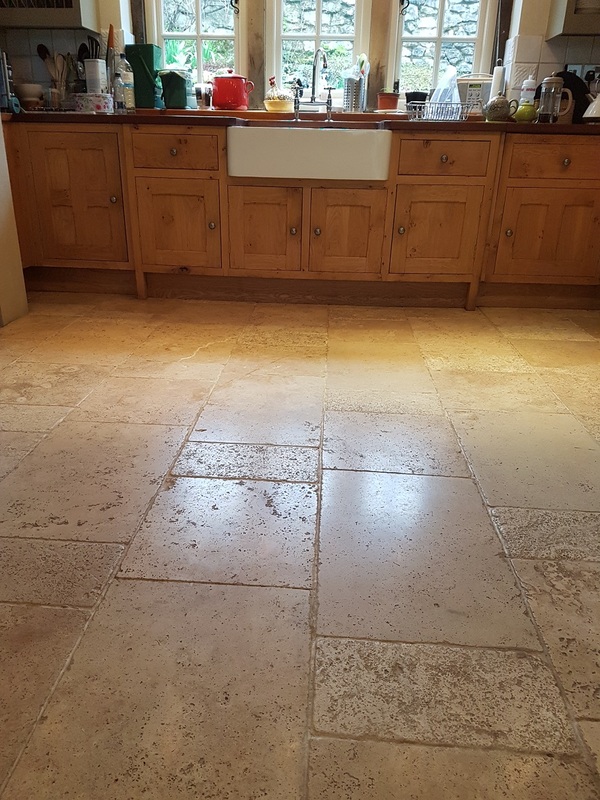 Details below of another Travertine tiled floor that we re-furbished recently in the kitchen of a house in Lutterworth which is a market town located in southern Leicestershire. 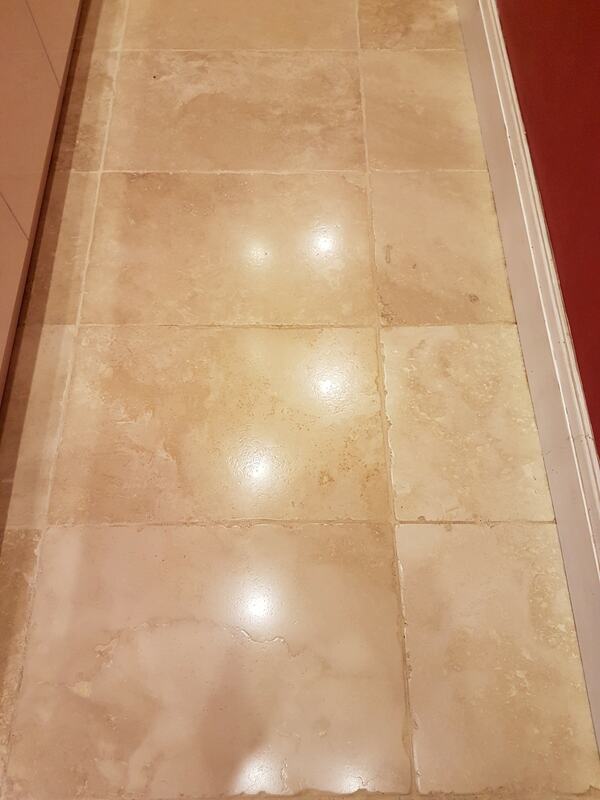 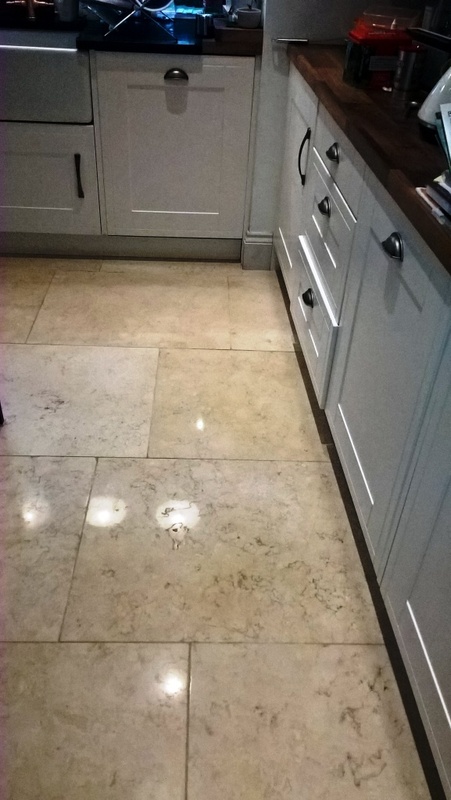 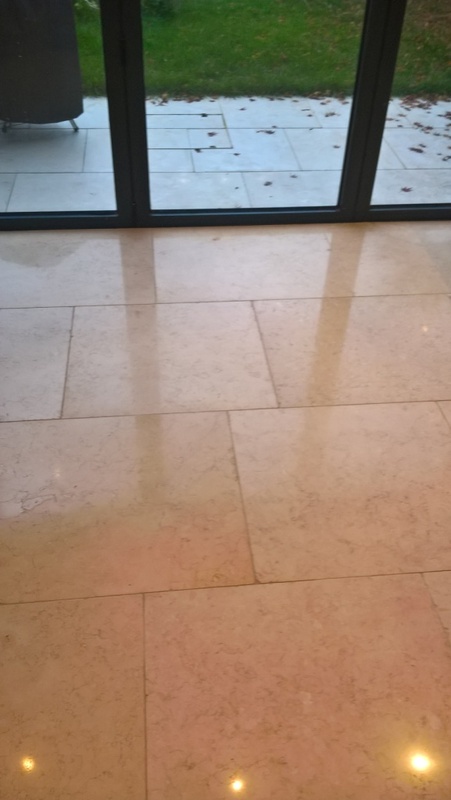 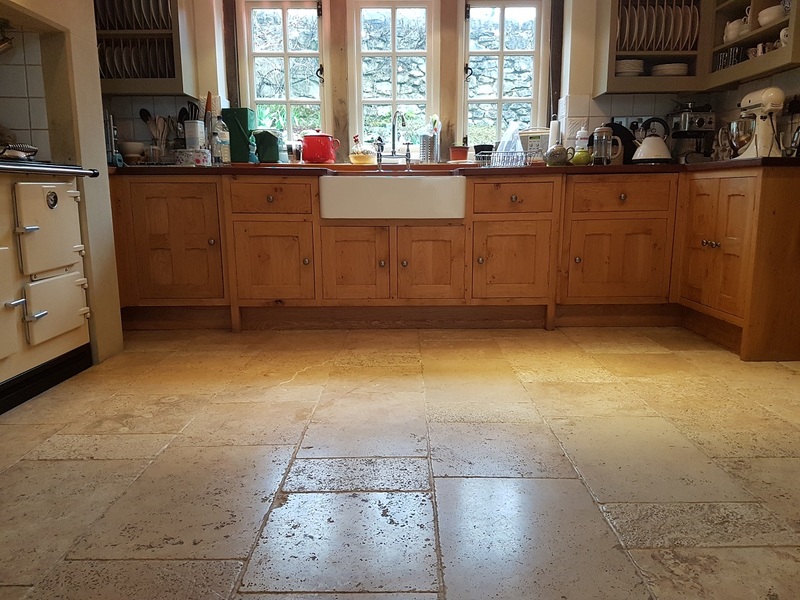 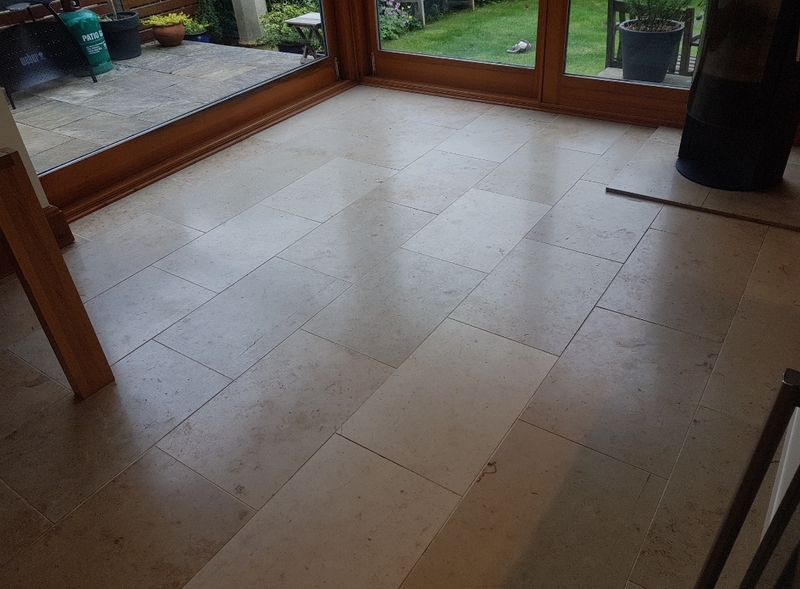 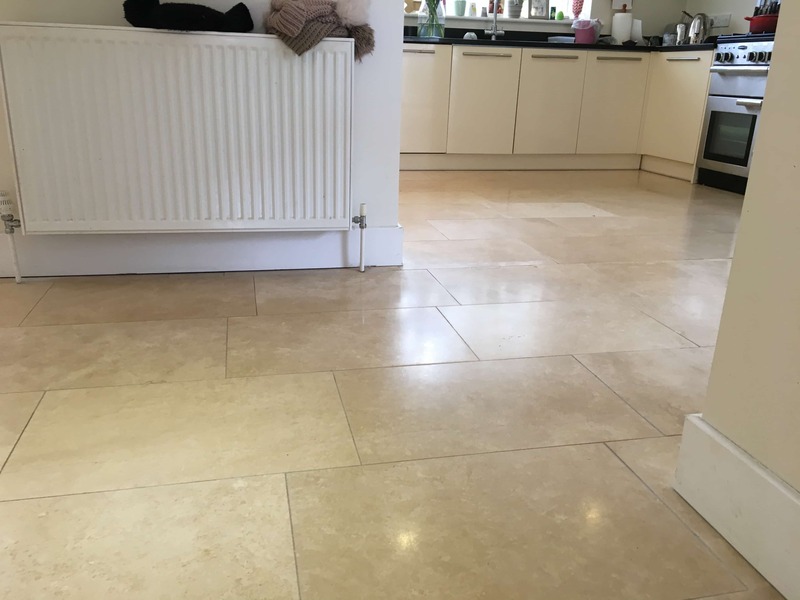 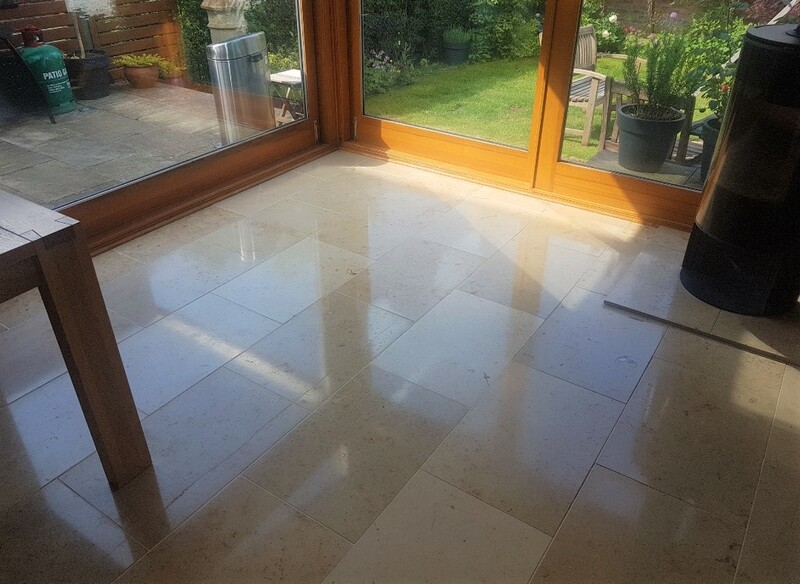 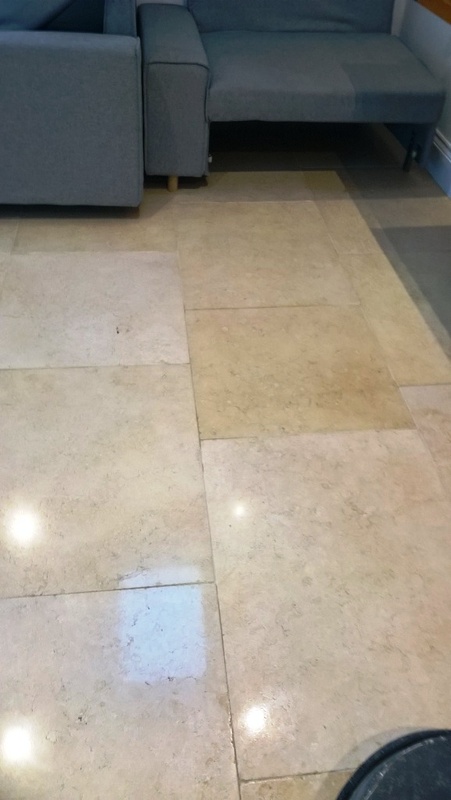 The floor was looking dull and flat and the colours had become washed out, it now needed burnishing to strip off the dirt and bring back the polish; another problem were the natural holes which you find in Travertine had not been filled and were now trapping dirt and proving difficult to clean. 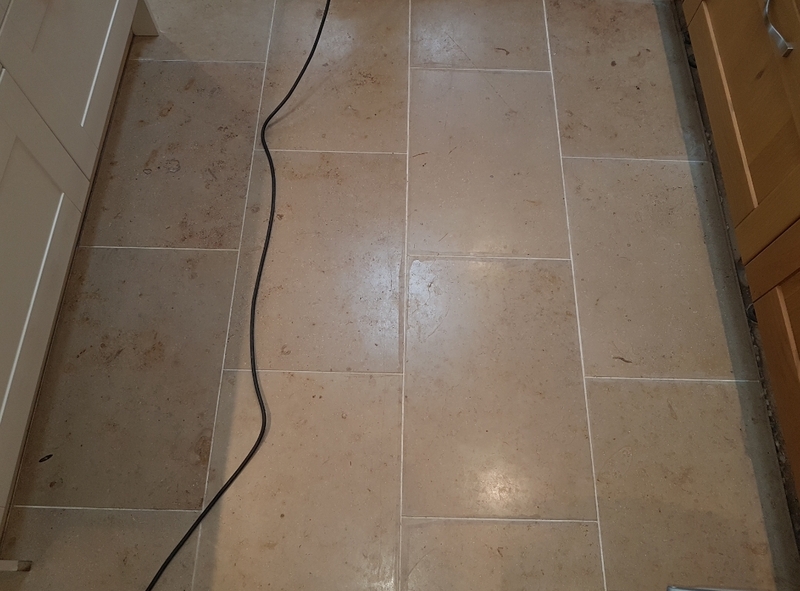 To deal with the ingrained dirt and to remove any surface coatings the floor was cleaned with a dilution of Tile Doctor Remove and Go, this is quite a strong product normally reserved from stripping sealers and other coatings but it’s also an effective cleaning product so to save time I decided to use this first giving the floor a thorough wash down and rinse afterwards. 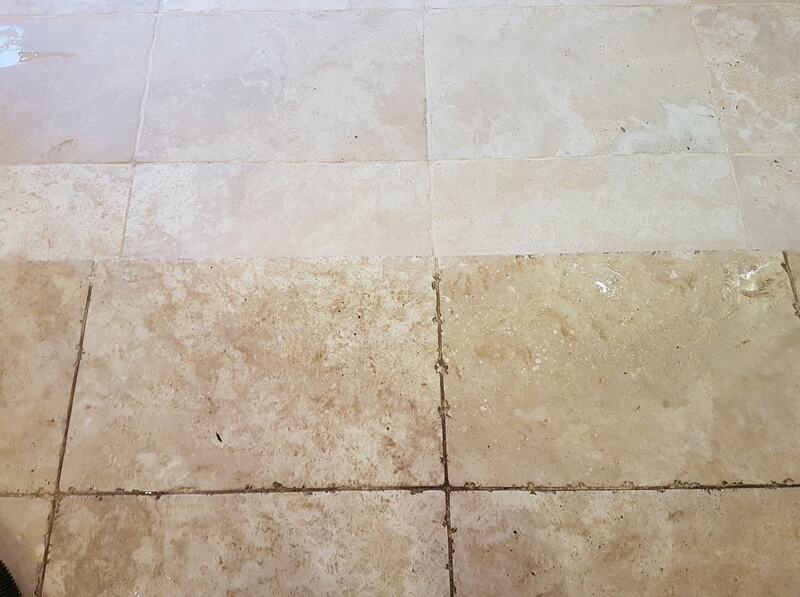 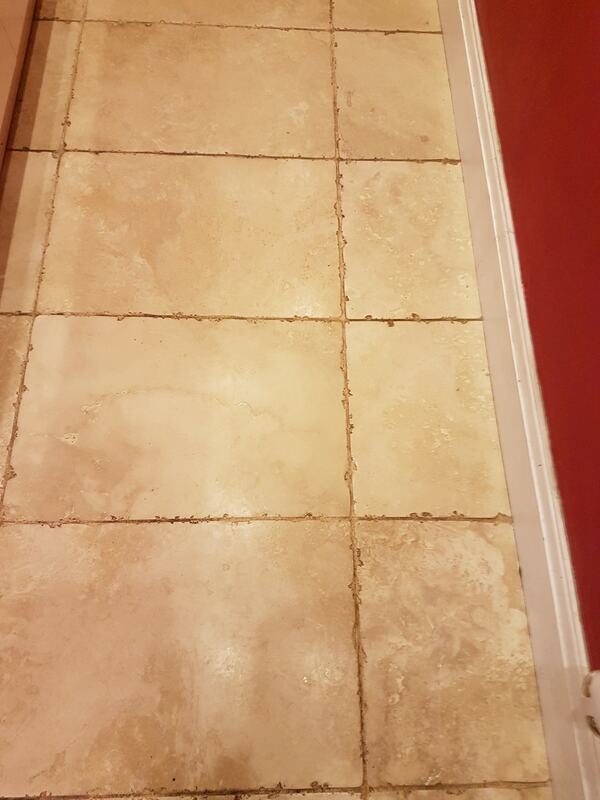 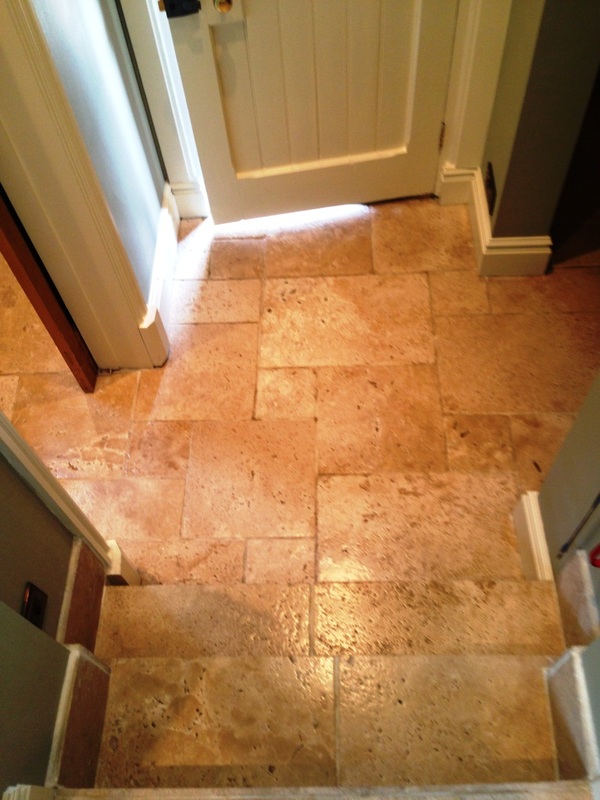 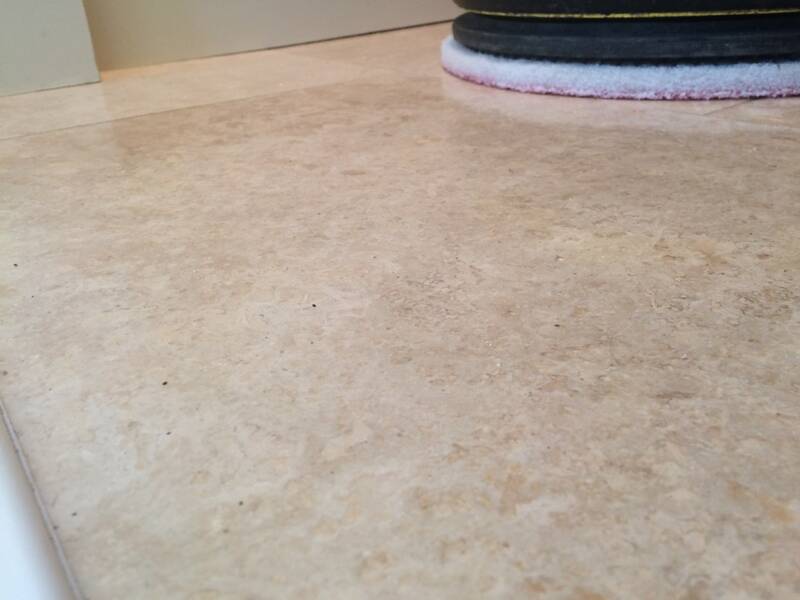 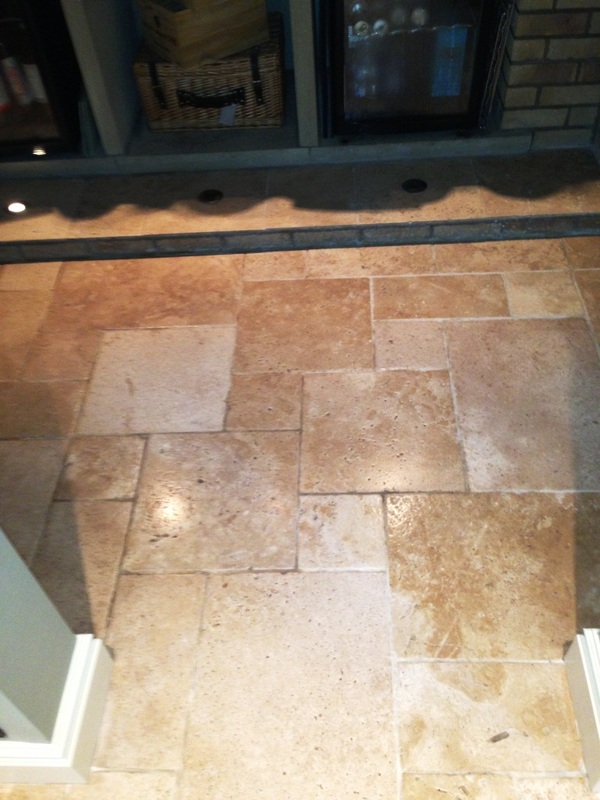 The grout was also given a thorough scrub during this activity and once that was done the soiled waster extracted the floor was inspected and the holes in the travertine filled using a special Travertine filler product. 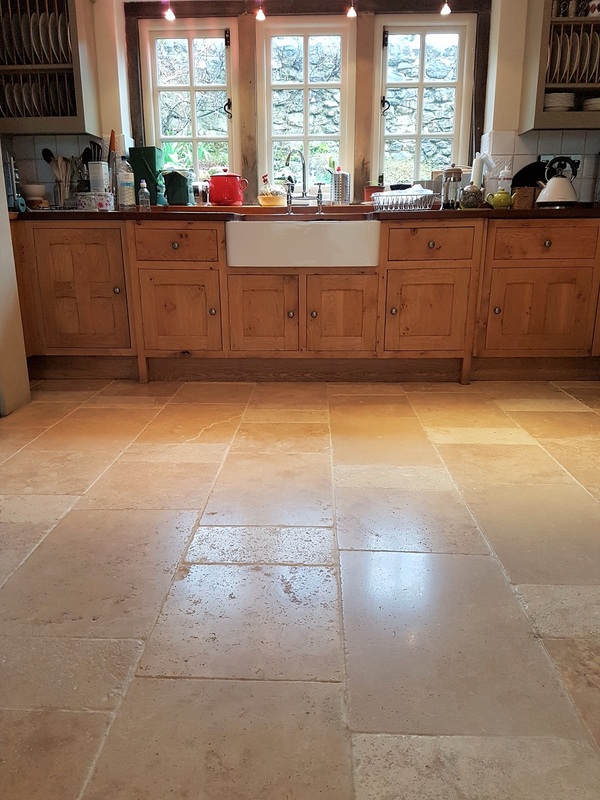 The next step was to burnishing the entire floor using a set of burnishing pads which strip back any surface dirt from the stone using a coarse diamond encrusted burnishing pad and then building up the finish with a medium, fine and super fine pad until you have restored the polish and appearance. 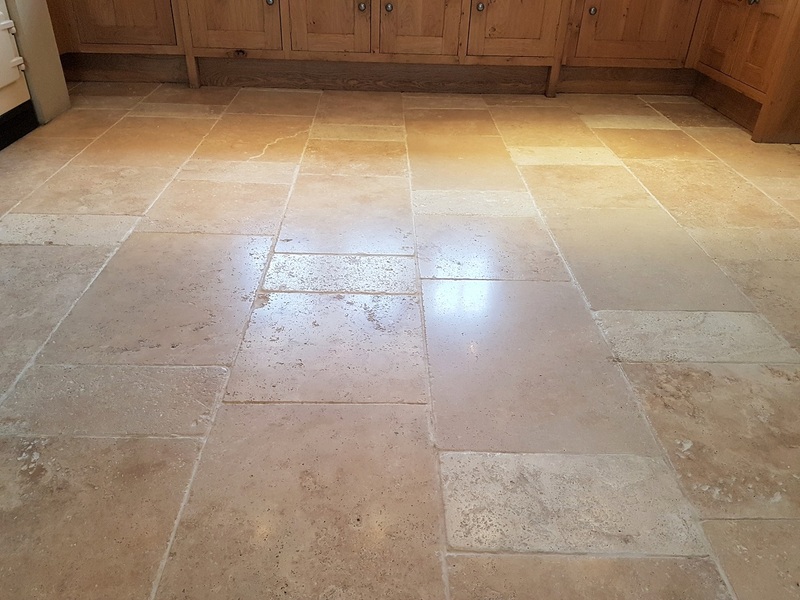 This process blends the Travertine filler added earlier into the stone so it’s impossible to tell the holes had been filled; I should mention you need to use little water which is used to lubricate the process and in-between each pad the resultant slurry is rinsed away. 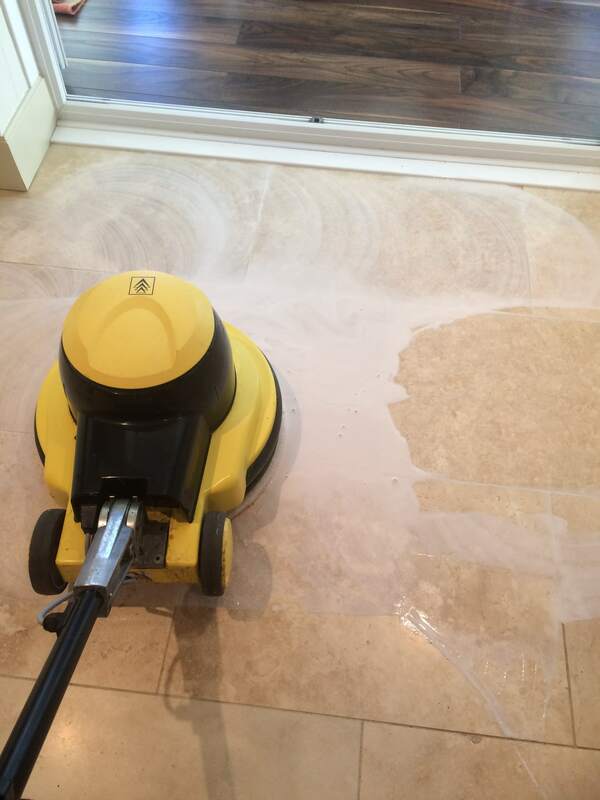 Once this is done the floor is given a thorough rinse which is then extracted and then left to dry overnight. 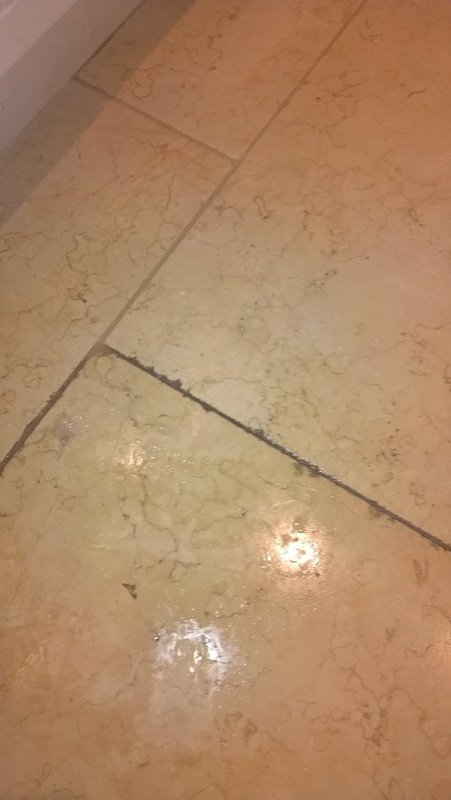 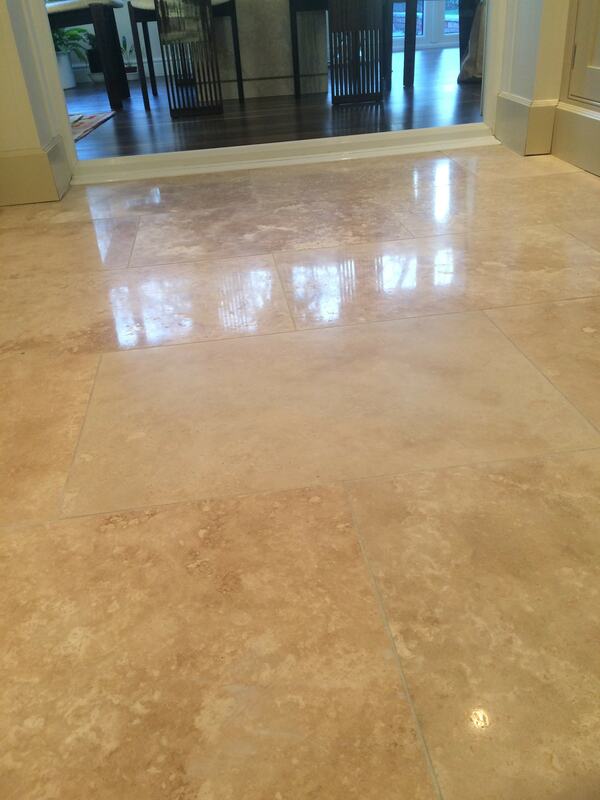 On our return the floor was checked to ensure it had dried out using a damp meter in a few different spots. 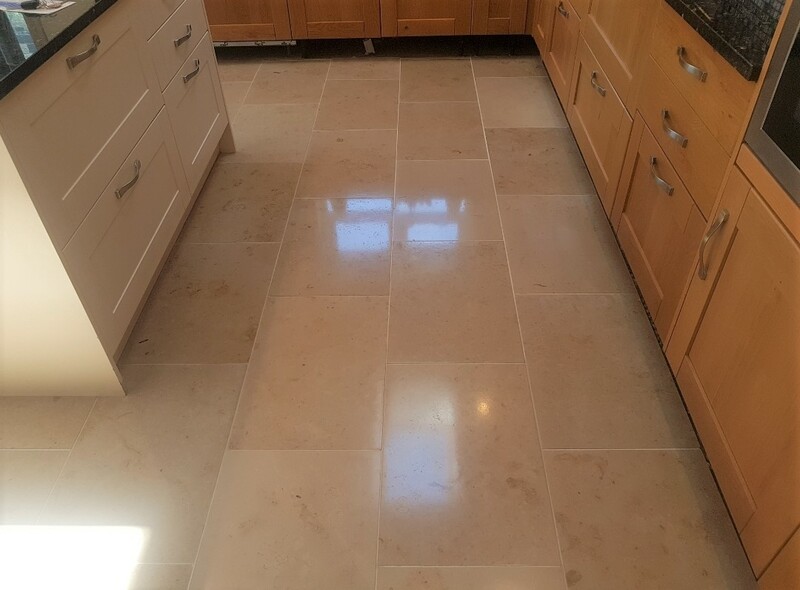 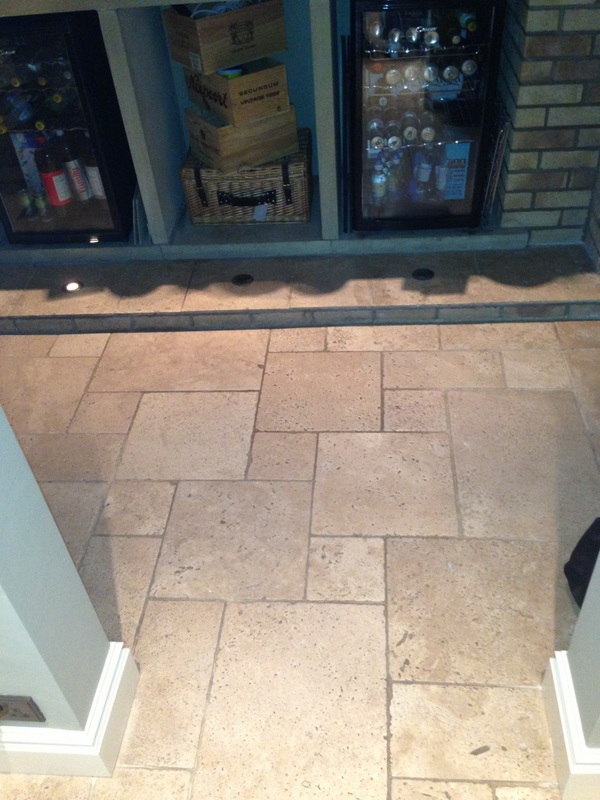 The floor was dry so it was sealed using a tow coats to Tile Doctor Colour Grow which is an impregnating sealer that gets into the pores of the stone to prevent dirt from becoming ingrained there; Colour Grow also enhances the colours in the stone and this works well on Travertine as it brings out the brown colours.